Home › Making › 3D Printing Becoming More Mainstream? 3D Printing Becoming More Mainstream? I was just in Sam’s club, and took this picture. 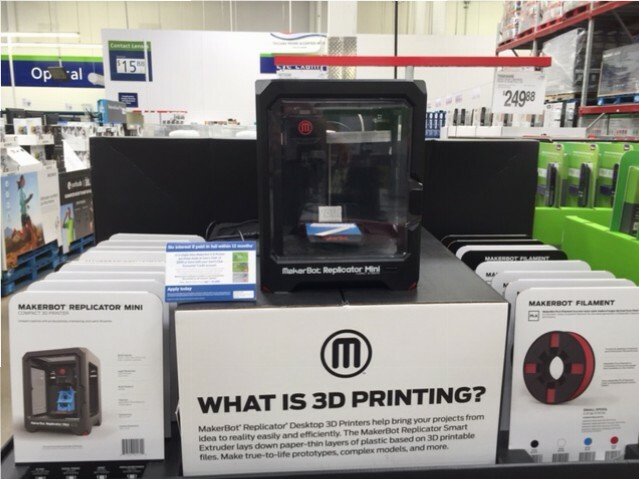 I guess if you can buy a 3D printer in conventional brick-and-mortar stores, it must be becoming pretty mainstream. The printer they are selling is the MakerBot Replicator Mini, which is considered to be a good (if slightly expensive) entry machine. The Sam’s club price was $1200, which is a couple of hundred dollars cheaper than MSRP. Biggest complaints I’ve heard about it are the small size (3.9″ x 3.9″ x 4.9″) and that it is relatively slow. On the other hand, it looks really cool, and has a built-in camera so you can check on progress remotely! Sam’s is also selling filament in 4 colors.